Learn best practices and tips on how your company can maximize tax incentives through our educational videos, webinars, whitepapers, calculators and interactive map. Hear how our customers captured significant tax savings by working with our team of tax experts. I was able to not only unlock significant tax savings, but also realize there are a lot of hidden assets in my company. CTI exposed a lot of value that we weren’t obtaining in terms of purchasing, building software and hiring. Find the latest updates on CTI, industry news highlights and information regarding upcoming conferences and webinars. Discover how tax incentives can save your company money by downloading our complimentary whitepapers. The Work Opportunity Tax Credit program allows businesses to save money on tax liability by issuing credits for new hires who qualify through the program. 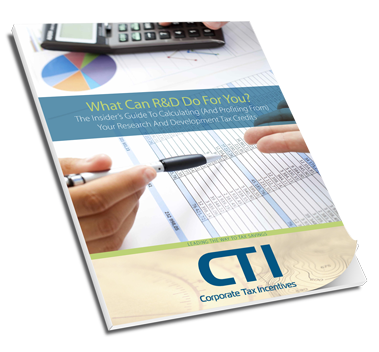 The Insider’s Guide To Calculating (And Profiting From) Your Research And Development Tax Credits - The elusive research and development (R&D) tax credit is one of the best-kept secrets of the IRS.